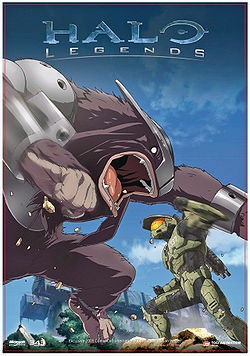 Odd One Out is one of the seven short films comprising the anime adaptation of the Halo universe, Halo Legends . Odd One Out is a non-canon and satirical interpretation of the franchise, featuring SPARTAN-1337. 1337 falls off a Pelican onto the surface of the planet below. While still in orbit, the ship's captain, Jacob Keyes, is informed of this. Master Chief assures him that "this sort of thing" happens to 1337 all the time. But that he was trained with the best and there is no need for worry. Yet, Cortana expresses a concern. Back on the surface, 1337 sees he's been left behind and tries to get the Pelican to stop and pick him up in vain when he discovers three children standing behind him. They think he is a robot, causing 1337 attempt to explain he is a SPARTAN and not a robot. Sap tries to tell 1337 that he shouldn't stand where 1337 was with Pom explaining it wasn't safe. 1337 is agitated at them ignoring him till he turns around and ends up being half swallowed by the kid's Tyrannosaurus. Sap throws a stick, causing the Tyrannosaurus to spit 1337 back out and fetch the stick. Just as 1337 is getting up, the Tyrannosaurus crushes him. While on High Charity, Truth sends Pluton, a genetically modified Jiralhanae, to kill John-117. The planet is revealed to be Cronkee, fourth planet in the Unicorn system. Truth orders Pluton to the planet, and after initial confusion over how to exit the Council chamber, the Brute does so, prompting Truth to sigh "I need a vacation...". Back on the planet, 1337 is attempting to make contact with John-117, still annoyed at the children who are following him. When Pluton lands, he tells the kids to escape and engages Pluton in a battle. He eventually gets knocked out after Pluton used his weapon, but the fight ends when it starts to rain. May and Guy look at the wreckage as Pluton runs off till the two meet with the children and ask them what happened. Pom explains their encounter with the SPARTAN and the Jiralhanae. Guy tells them that they'll take care of it, but May thinks otherwise. After more debate 1337 appears and is ready to fight again. May and Guy tell 1337 about 'Momma' and how she fought off bird headed pirates once and that they could help. 1337 hesitates but then agrees when they engage Pluton in a hard battle. When Pluton starts to charge up again, SPARTAN-1337 distracted the Jiralhanae by shouting, "Hey, what the heck is that?!" to make their escape. Suddenly, the crashed ship that SPARTAN-1337 found earlier creates a Slipspace rupture. The ship fires a MAC at Pluton, causing him to be thrown into the rupture. Soon after, the ship re-establishes radio communication, which is later received by Cortana. Master Chief says he'll try to contact 1337 when Cortana says that there's another AI living on the planet. Master Chief stops to allow Cortana explain that she was just tinkering with the slipspace drive. When asked by Master Chief if he should collect the AI, Cortana then tells him not to. May, Guy, Loo, Sap, and Pom return home and tell Momma about their adventure. 1337 looks back at the ship one last time before starting to walk, being contacted by Master Chief. Master Chief orders him to head to the rendezvous point asap. Just as a shadow consumes 1337, 1337 confirms and tells Master Chief he might be a little late as a pterodactyl carries him off. Pluton is found to be embedded in a Halo. Odd One Out made many references to Toei's popular Dragon Ball anime series, such as the Pluton muttering "Kamehameha" when he grabbed SPARTAN-1337 and SPARTAN-1337 being grabbed by a pterodactyl at the end of the episode, as well as Pluton's arrival on the planet in a spherical capsule that leaves a fairly large crater upon landing. It is hinted that "Momma" fought off Kig-yar when establishing the planet as her home. The most likely explanation for Covenant being on the planet is that they were trying to collect the AI. When SPARTAN-1337 activates his Bubble Shield he does so in the same manner as the Master Chief in the Starry Night trailer for Halo 3. Loo, Sap, Pom and SPARTAN-1337 accompanying a Tyrannosaurus rex. Pluton charging his attack. Also a reference to the Shoop Da Whoop meme. Guy and May preparing to attack.